It's been a good year for knitting so far. I've finished five pairs of socks, though two were started in 2014 (one in October, one in November) and delayed by my decision to finish the socks my mother had started for a friend 1500 miles away. So that's three pairs started in 2015 and finished in 2015, and another one nearing completion...I'm over halfway down the feet of both socks. And it's not like there haven't been interruptions--I haven't been able to knit every day. Pictures behind the cut. 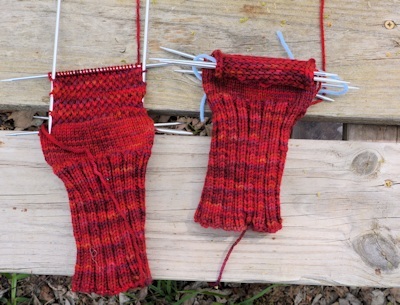 Right: Wool shorty socks made from combination of leftover yarn and yarn bought for striping. Early image of pair now more than halfway down the foot. Yarn is Mountain Colors "Ruby River"
They look this dark because it's a cloudy day and I took the picture in the kitchen, with a mix of LED and camera flash. I have a lot more iknitting to do this year. I need at least six more pairs of the shorty socks, six pairs of regular socks (to replace worn out ones) and should do a couple of pairs for friends. In theory, I can do two shorty pairs a month or one regular pair a month (that, and do the other stuff I have to do, like finishing this book and starting another plus other contracted work) but we'll see. 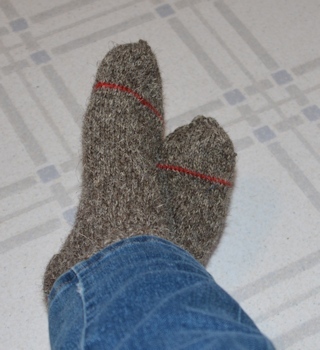 Are you happy with the Herdwick socks, or are they too scratchy? I'm a spinner, and have 20 ounces of Herdwick roving I've been debating what to do with. I hadn't thought of spinning for socks, I must admit. If it were fleece, I'd consider combining it with something a bit softer, but roving is a ready-to-spin preparation. Unfortunately, 20 ounces just isn't enough for a sweater, at least, not with that particular fiber. 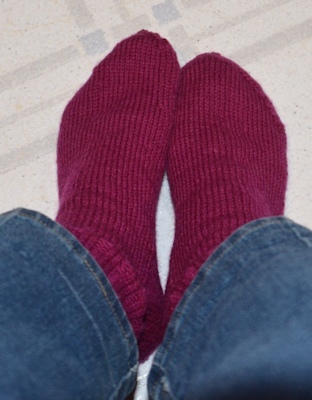 I love the Herdwick socks! I know, they look hairy and scratchy, but they aren't, and they don't bother my hands when I knit them. The yarn I bought (no longer available) from Crookabeck Farm Shop is worsted-weight, and has a lot of the natural lanolin still in it--it actually helped my dry, hang-nailed finger tips. 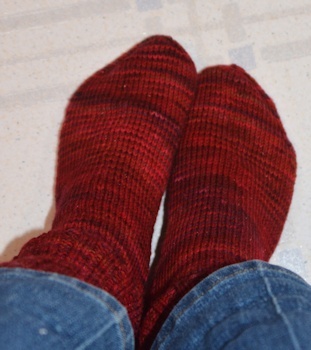 The socks are wonderfully warm, soften my feet with the lanolin in the yarn, and if I could buy more of the yarn than I already have, I would. The same outlet sells Aran weight Herdwick yarn, but has started mixing Angora mohair in with it for worsted-weight or DK weight, and I don't want that. 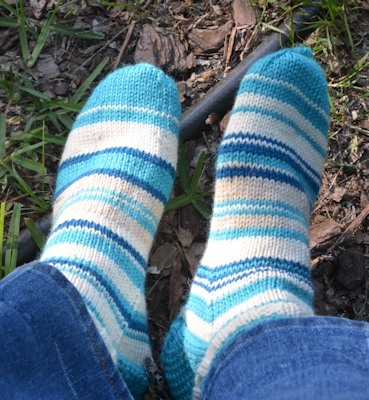 I make socks of worsted-weight only (I like thick cushiony socks, and also have vision problems and thus need to knit socks with larger needles than are needed with regular thin sock yarn.) This pair with the red stripe is the second pair I made. The two pairs are my go-to socks for really cold days. I have other spinning projects on my plate pretty much through July at this point, but I will keep you in mind if I do get to it, and remember you like worsted weight for socks. 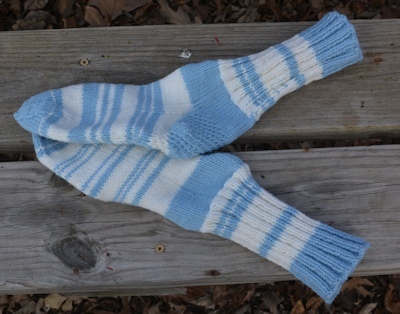 I love the blue and white socks -summer smiles! re-the dry hands/hangnails, the subject came up in an embroidery community -the suggestion was 50% diluted cider vinegar, it really does seem to help with the dry skin! I entered drafting triangles into their search engine.